Between 2018 and 2020, we will replace 25,000 feet of track and 6.5 miles of signals on the Green Line, between Beaconsfield and Riverside on the D Branch. To do this work, we need to shut down service on weeknights and on some weekends. 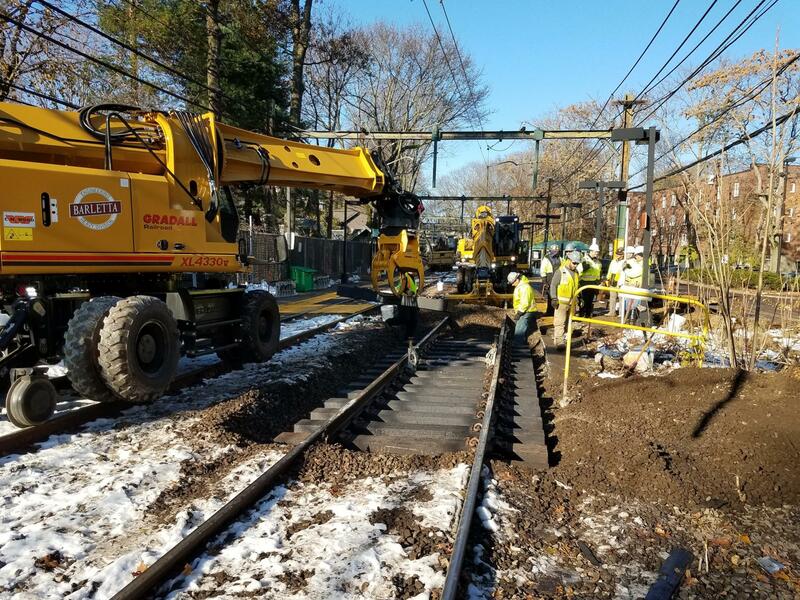 Shuttles will replace train service, in coordination with the teams doing flood control work at Fenway, track repairs between Fenway and Riverside, and accessibility upgrades at Newton Highlands. What are signals, and why do they need to be replaced? The D Line used to be a Commuter Rail route, and when it was converted to light rail in the 1950s, we installed much of the signal infrastructure that’s still in use today. Those signals, though they are still helping us run trains safely today, are not as efficient as modern signal systems: when they indicate a problem, a crew member has to go out to the tracks to diagnose and fix the problem. This can cause long, frustrating delays in service. We’ll replace them with a more centralized, digital system that’s easier to maintain and monitor. And, when there is a problem, our team will be able to more quickly and easily diagnose and fix it. Why do you need to replace tracks, and are the old tracks safe? Railroad tracks can last many decades. To ensure your safety, engineers regularly measure the wear and tear on all the tracks in our system—that includes checking the rails, railroad ties, and gravel between the rails that helps with support and drainage (this is called ballast). The tracks between Beaconsfield and Riverside are still safe for daily use, but our engineers have decided it’s time for all new tracks, ties, and ballast. Because this is such a big part of the Green Line, work is broken up into sections—we can do it overnight and on weekends when fewer people ride the Green Line, but it will take us about 30 months to complete it. When the new tracks are installed, you’ll notice that the Green Line can travel faster: New tracks will allow us to lift speed restrictions on particularly outdated sections of the route. Shuttles will replace train service on weeknights and some weekends through 2020. Because these shutdowns are also being coordinated with work at Fenway and Newton Highlands, the schedule is subject to change due to weather, construction progress, and Red Sox home games—we will start shuttle service later to accommodate increased ridership after evening games. We will share specific dates and times in advance on our Green Line D Shuttle schedule page, and you can always check Green Line D alerts while planning your trips. Mondays-Fridays, April through December from 9 PM until the end of service through 2019 and 2020. 15 weekends, Saturday and Sunday, scheduled through 2019 and 2020. The noisiest work includes cutting the rails with a saw or torch, and tamping the track to the proper elevation. Noise levels are monitored monthly, and we respond to all noise complaints. If you would like to report a noise issue, call the 24/7 hotline at 508-676-3550. You can also email the project team at DBranchInfo@MBTA.com with any questions. Removing ties along the tracks of the Green Line D branch. Stay up to date on D Branch work by signing up for regular email updates. To report a noise complaint or issue, call the 24/7 noise hotline at 508-676-3550.